This week as well, ISIS in Iraq and Syria continued to withstand intensive airstrikes by the US and Russia, which were joined by Britain as well. The target of these attacks was ISIS’s oil infrastructure in northern Syria, in order to harm its principal source of income. The Russian airstrikes were accompanied by a media campaign accusing Turkey of trading in oil with ISIS. Iran also joined the anti-Turkish campaign. In response, Erdoğan announced that he would resign from office if the allegations that Turkey was buying oil from ISIS were proved. This week, there were no significant changes in the various combat zones in Iraq and Syria. Worthy of note are the ongoing Iraqi military pressure on ISIS in the city of Ramadi and its environs; power struggles between ISIS and the rebel organizations near the Turkish border north of Aleppo; and the continuing power struggles, which include mutual assassinations, in the southern Syrian Golan Heights between the ISIS-affiliated Al-Yarmouk Martyrs Brigade and rebel organizations, including the Al-Nusra Front. In San Bernardino, in the western US, a lethal attack (14 dead, 17 wounded) was carried out by a couple of Pakistani descent. In London, a stabbing attack was carried out on a train in an Underground station by a young man who called out, “This is for Syria.” ISIS announced that the couple who carried out the attack in San Bernardino were among its supporters, but did not claim responsibility for the attack. In the ITIC’s assessment, both attacks were inspired by ISIS, like others that have already been carried out in the West, but were not carried out under its direction. 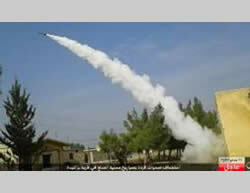 Syria– the airstrikes were concentrated in the areas of Marea (north of Aleppo), Ain Issa (northwest of Al-Raqqah), Deir al-Zor and Al-Raqqah. The targets included vehicles, buildings, operatives and oil fields, among other things. Iraq– the airstrikes were concentrated in the areas of Albu Hayat (south of Haditha), Abu Kamal, Mosul, Ramadi, Sinjar, Sultan Abdullah (south of Mosul), Habbaniyah and Kisik. The targets included operatives, battle positions, artillery positions and vehicles, among other things. According to an announcement by the US-led coalition forces, on December 3, 2015, they carried out 26 airstrikes, harming ISIS’s oil production capability in Syria (Daily Star, December 4, 2015). In addition, at least 32 ISIS operatives were reportedly killed and around 40 injured in a series of airstrikes carried out by coalition forces on December 5, 2015, in the area of Al-Raqqah (Al-Arabiya TV, December 6, 2015). US President Barack Obama said in a speech to the nation that the US was working with its allies to curb ISIS’s activity and that since the terrorist attack in Paris, the intelligence cooperation with its European allies has increased. He added that the US was working with Turkey on the closure of the border with Syria. He also said that the United States was cooperating with Muslim countries and with Muslim communities in the United States in order to fight the extremist ideology promoted by ISIS via the Internet (White House website, December 6, 2015). US Secretary of State John Kerry said that after discussions with Turkish President Tayyip Erdoğan, it was decided to close the border strip that had remained open between Syria and Turkey. This was in order to prevent illegal passage of oil and foreign fighters (Al-Jazeera TV, December 2, 2015). In the past, the United States and Turkey also announced the closure of the Turkish-Syrian border. Turkey has indeed taken some steps on the ground, which have so far proved to be ineffective. Now we must wait and see whether the decision announced by Kerry is implementedin practice. On December 2, 2015, by a majority of 390 to 211, the House of Commons approved a plan to expand the RAF airstrikes against ISIS in Syria.Several hours later, British fighter planes began attacking ISIS targets in Syria (The Guardian, December 3, 2015). Britain’s Defence Minister Michael Fallon confirmed that four British fighter planes based in Cyprus had carried out successful airstrikes on the Al-Omar oil field in Syria (BBC News, December 3, 2015). According to Fallon, Britain would be involved in operations against ISIS targets in Syria for a prolonged period (The Guardian, December 5, 2015). The Al-Omar oil field, located southeast of Deir al-Zor,is considered the largest oil field in Syria. 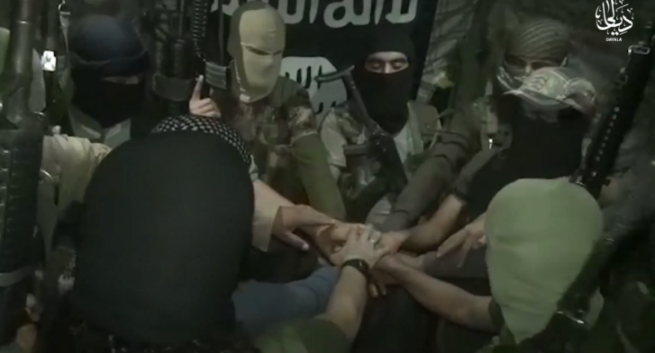 The field was held by Al-Nusra Front operatives since November 2013 and taken over by ISIS operatives in early July 2014 (aawsat.com, December 6, 2015). The airstrike, carried out by British aircraft against facilities in the Al-Omar oil field is part of an overall effort by Russia and the US-led coalition to harm ISIS’s principal source of income. On December 4, 2015, the lower house of the Bundestag approved the government’s plan to send German Army troops to join the military campaign against ISIS in Syria. It approved the operation of six reconnaissance aircraft and a frigate, which will help protect the French aircraft carrier Charles de Gaulle, which is off the coast of Syria. It also approved sending a tanker aircraft and 1,200 troops.However, the decision does not permit the German Air Force to attack ISIS targets on Syrian territory (christiantoday.com, December 6, 2015). This week as well, Russia’s intensive air operations against targets in northern Syria continued. The Russian airstrikes were concentrated in the areas of Al-Hasakah, Latakia, Hama, Idlib and Homs. In this context, Russian aircraft attacked fuel tanks in the Aleppo province (Al-Durar al-Shamiya, December 4, 2015). According to the Russian Defense Ministry spokesman, as part of its air campaign in Syria, Russia hit dozens of oil production and refining sites, as well as 1,000 ISIS tankers.According to the spokesman, this has reduced ISIS’s revenues by approximately 50% (Fox News, December 4, 2015). According to reports by Russian sources, since Russia joined in the fighting in Syria, Russian forces have carried out over 2,300 sorties above Syria, hitting over 4,100 terrorist targets (RT, December 5, 2015). In view ofthe tension between Russia and Turkey following the interception of the Russian aircraft, Russia has accused Turkey in general, and Turkey’s President Erdoğan and his family in particular, of trading in oil with ISIS. The Iranians have also joined the media campaign against Turkey. For example, according to Mohsen Rezaee, Secretary of the Expediency Discernment Council, Iran has proof of deals for the transfer of oil from ISIS to Turkey. 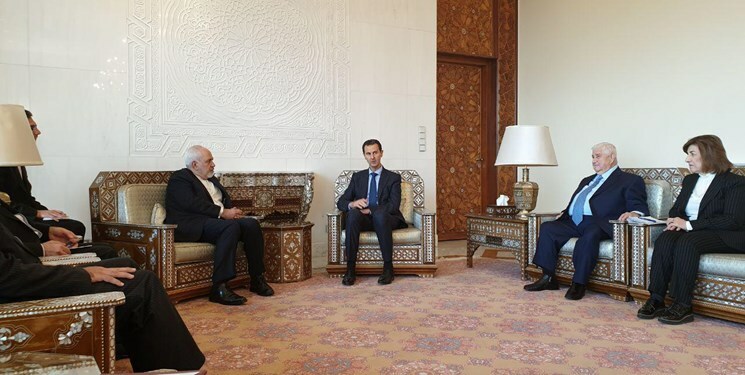 According to him, if the Turkish government is unaware of the matter, Iran is prepared to furnish it with all the information, since the Iranian advisers in Syria photograph all the routes used by ISIS’s oil tankers on their way to Turkey (Fars, December 4, 2015). In response,Erdoğan announced that he would resign from office if the allegations that Turkey buys oil from ISIS turn out to be true, and that no country has the right to insult Turkey by accusing it of buying oil from ISIS. The Russian Defense Minister wrote on his Facebook page that photos taken by American drones show trucks loaded with oil crossing the border into Turkey from an area in Syria controlled by ISIS. According to him, these photographs prove that ISIS is smuggling oil to Turkey for Tayyip Erdoğan and his family (ibtimes.com, December 5, 2015). According to the Minister, at least three routes are used for smuggling oil from Syria to Turkey: the western smuggling route leading to a port in the Mediterranean; the northern smuggling route leading to the Batman refinery (located about 100 km from the border with Syria); andthe eastern smuggling route leading to a large transit base in the city of Cizre, Turkey. He said that the illegal smuggling of oil to Turkey amounted to 8,500 oil trucks carrying 200,000 barrels of oil a day (RT, December 3, 2015). According to Russian Deputy Defense Minister Anatoly Antonov, Turkey is ISIS’s biggest oil customer. He also accused Erdoğan and his family of involvement in distributing the oil produced in areas controlled by ISIS. According to him, the oil is carried to Turkey by thousands of tankers (Cumhuriyet, December 2, 2015). In light of these accusations, Russia’s ambassador to the UN Vitaly Churkin announced that Russia was formulating a draft resolution at the UN Security Council that would step up the enforcement of the Council’s Resolution 2199 from 2015, which aims to prevent illegal trading in oil with terrorist groups (RT, December 1, 2015). A video on YouTube posted by the Russian Defense Ministry shows trucks crossing the border from Syria to Turkey through one of the border crossings. According to the Russian Defense Ministry, these trucks are involved in illegal oil trading between ISIS and Turkey (YouTube, December 2, 2015). In northwest Syria, clashes continued in the areas of Aleppo and Homs, without significant changes in the situation on the ground. In addition, there were clashes this week between ISIS and other rebel organizations north of Aleppo, near the Turkish border.ISIS, the Al-Nusra Front and the other rebel organizations are apparently trying to establish their presence near the Turkish border. It was done in order to allow the continued existence of their controlled logistics channels of communication between Syria and Turkey. This is in light of reports about Turkey’s intention to establish an ISIS-free buffer zone in northern Syria, with the support of the United States. There were clashes this week between ISIS and the rebel organizations that oppose it, particularly the Al-Nusra Front, in the area north of Aleppo, near the Syrian-Turkish border. These clashes centered on the town of Baraghedeh, about 4 km south of the border with Turkey. On December 3, 2015, ISIS reported that his operatives had captured the town from the hands of the rebel organizations. Shortly thereafter, the rebel organizations announced that the Free Syrian Army and other groups had regained control of the town. According to reports by the rebel organizations, more than 10 ISIS operatives were killed there (all4syria.info, December 3, 2015). This week as well, local clashes continued between the Syrian Army and ISIS in the area of the Kuweyres military airbase, east of Aleppo. According to a report from December 6, 2015, the Syrian Army attacked an ISIS post near a power plant located about 11 km west of the airbase. In addition, clashes continued along several routes leading to the airfield (syriahr.com, December 6, 2015). This week, clashes continued southeast of Homs.ISIS operatives are reportedly halting the advance of the Syrian Army by carrying out suicide bombing attacks, causing heavy losses.This week, two ISIS suicide bombers carried out lethal terrorist attacks against the Syrian Army: the first near the town of Mheen, 17 km west of the city of Al-Qaryatayn, and the second in Tilal al-Rumailah, about 4 km northeast of Al-Qaryatayn (a3maqagency.wordpress.com, December 3, 2015). ISIS announced that its operatives had killed over 85 Syrian Army soldiers near the city of Al-Qaryatayn. The dead reportedly included a Syrian officer with the rank of aqid (colonel) and three other officers (all4syria.info, December 3, 2015). According to a report from this week, Al-Nusra Front Emir (leader) Abu Jalibib was killed (or injured) in the area of Daraa. This was done by an IED planted by Al-Yarmouk Martyrs Brigade operatives near the village of Kahil (Khatwa, December 3, 2015). 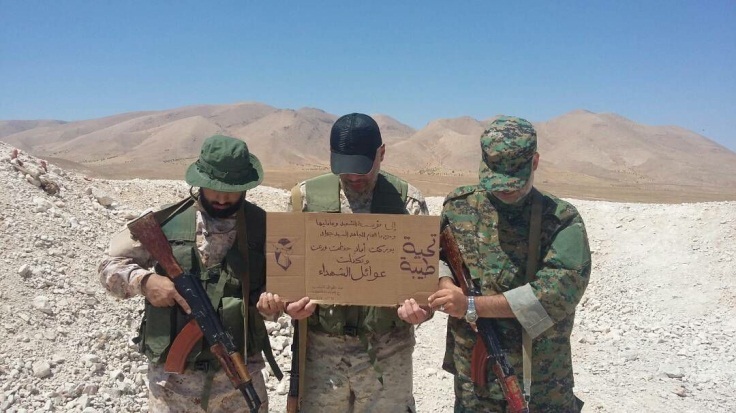 If this information is confirmed, then this was the Al-Yarmouk Martyrs Brigade’s response for the elimination of its senior commanders by the Al-Nusra Front and other rebel organizations, as part of power struggle in the southern Syrian Golan Heights. The Iraqi Army continued its efforts to establish its control around the city of Ramadi, which it is trying to recapture from ISIS. According to an unverified report, this week the Iraqi Army managed, for the first time, to take over several residential neighborhoods in the city itself. ISIS, in turn, is trying to harm the Iraqi Army forces surrounding the city through suicide bombing attacks. In the city of Baghdad, the number of attacks carried out by ISIS has decreased recently, although they have not ceased altogether. On December 4, 2015, an IED exploded in the west of the city, killing one civilian and wounding seven others (Baghdad Times, December 4, 2015). The relative improvement in the security situation in Baghdad followed the security measures taken by the Iraqi government after a wave of attacks carried out by ISIS. This week as well, fighting continued in the Al-Anbar province, particularly in the city of Ramadi and its environs. The Iraqi Army continues to tighten the siege of the city by taking over large areas around it and blocking ISIS’s supply routes to the city. The Iraqi Army announced that on December 4, 2015, it had killed 30 ISIS operatives north of the city of Ramadi during an attempt by ISIS operatives to break the siege on the city (Baghdad Times, December 4, 2015). According to a report from December 6, 2015, the Iraqi Army managed to take over several areas in the city of Ramadi itself, including the Tahrir and Al-Qadisiyyah areas in the Al-Tamim neighborhood (Sky News in Arabic, December 6, 2015). If this report is confirmed, then this represents an achievement for the Iraqi Army, which has so far operated only on the outskirts of the city and its surroundings but refrained from entering it. ISIS, in turn,is trying to harm the Iraqi Army forces through suicide bombing attacks.On December 5, 2015, ISIS claimed responsibility for a series of five suicide bombing attacks against the Iraqi Army west of the city of Ramadi. The suicide bombers were four Syrian terrorists and one Tajik terrorist. The five blew themselves up, one after another, inside car bombs (Akhbar al-Muslimeen, December 5, 2015). Fighting continues in the region of the city of Samarra. The Iraqi Army has tightened its security measures around the city for fear of attacks by ISIS. In the eastern Salah al-Din province, the Iraqi Army took steps to disconnect ISIS’s supply lines to the province (Al-Arabi al-Jadeed, December 4, 2015). On December 6, 2015, an ISIS-affiliated website posted photos of the fighting in western Samarra (Hadem al-Aswar, December 6, 2015). During the week, the Egyptian security forces continued military operations against ISIS’s Sinai branch. In this context, they carried out intensive activity, mainly in the area of Rafah, Sheikh Zuweid and Al-Arish.Dozens of jihadists were killed in the operation, dozens of suspects were detained, weapons were confiscated and many IEDs were neutralized. The Egyptian security forces received information about an attempt to smuggle a large quantity of weapons, including rockets. The smuggling was carried out using two trucks belonging to ISIS operatives in southern Rafah. 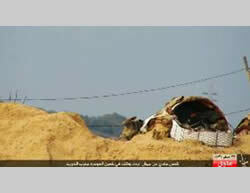 The Egyptian security forces attacked the two trucks from the air with helicopters, completely destroying them (Al-Watan, December 6, 2015). The Egyptian Armed Forces published an infographic summarizing the Border Police activity in November 2015. According to the infographic, during the month, 478 different weapons were confiscated, including rifles, pistols, mortars and explosives, and 610 people of various nationalities were detained. These detentions were carried out in both the Sinai Peninsula and on the border between Egypt and Libya. In addition, 20 tunnels in the Rafah area were destroyed (the Facebook page of the Egyptian Armed Forces Spokesman, December 7, 2015). On December 5, 2015, an IED exploded near an APC of the Egyptian security forces in the area of Al-Ahrash (north of Rafah), destroying the APC. The blast reportedly killed an officer with the rank of major and a soldier and wounded three others (Twitter, December 5, 2015). On December 5, 2015, an IED was detonated at a police APC south of Al-Arish (Twitter account affiliated with ISIS’s Sinai province, December 5, 2015). On December 5, 2015, an ISIS-affiliated operative posted a photo showing an Egyptian soldier being shot by an ISIS sniper near a machinegun position in Al-Ujrah, south of Rafah (Twitter; justpaste.it, December 5, 2015). On December 6, 2015, a man was killed and a few others were wounded when an IED planted on the coastal road in Al-Arish exploded (Al-Masri al-Youm, December 7, 2015). In the wake of activity by the Israeli security forces, in October – November 2015, five young men in their twenties, residents of Nazareth, were detained. The five were detained after the Israeli security forces received information that they had held meetings and were being trained on the use of firearms. Their interrogation revealed that during the past year, they had undergone a process of religious radicalization, in which they had expressed support for ISIS. The five would meet in secret and watch videos related to ISIS and speeches by religious leaders affiliated with it. 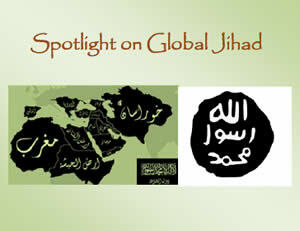 They would also discuss the need to carry out a jihad against the infidels. 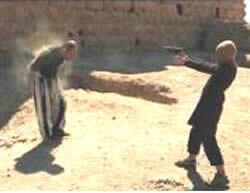 At the same time, they worked to obtain weapons and also practiced shooting on various occasions near Nazareth. At least one of the squad operatives expressed his desire to go to Iraq and Syria to fight in the ranks of ISIS, as well as his desire to carry out an attack “against the Jews” (Israel Security Agency, Ynet, December 8, 2015). ISIS’s activity is prohibited in Israel: on September 3, 2014, the Minister of Defense declared ISIS an unlawful association. On October 25, 2015, the Israeli government declared ISIS an illegal organization. The death of Abu Nabil al-Anbari constitutes a blow to ISIS’s top command in Libya, and might add to its difficulties in the city of Derna and in eastern Libya in general. However, in the ITIC’s assessment, it will not significantly impair ISIS’s military and governmental capabilities in Sirte and in western Libya in general, where ISIS continues to establish itself after it lost its strength in the east. Pentagon Spokesman Peter Cook confirmed that one of ISIS’s leaders in Libya was killed in a US airstrike last month. He was Abu Nabil, who was killed in the city of Derna. According to Peter Cook, this was the first attack carried out by the United States against ISIS leaders in Libya. The ISIS operative who was killed in the targeted killing was Abu Nabil al-Anbari, an ISIS operative from Iraq. He was a close friend of ISIS leader Abu Bakr al-Baghdadi and previously served as governor of the Salah al-Din province in Iraq. Abu Nabil was sent to Libya by ISIS’s leadership and was one of its top commanders there. Abu Nabil is suspected of being the operative shown in the ISIS video that documented the executions of 21 Egyptian Copts on the beach in Libya (The Daily Mail, December 7, 2015). In the meantime, ISIS operatives continue to hold the area of Al-Fataeh, dominating the city of Derna. In this area, they are facing pressure from a local jihadi group affiliated with Al-Qaeda and from the Libyan Army which supports the Tobruk government. 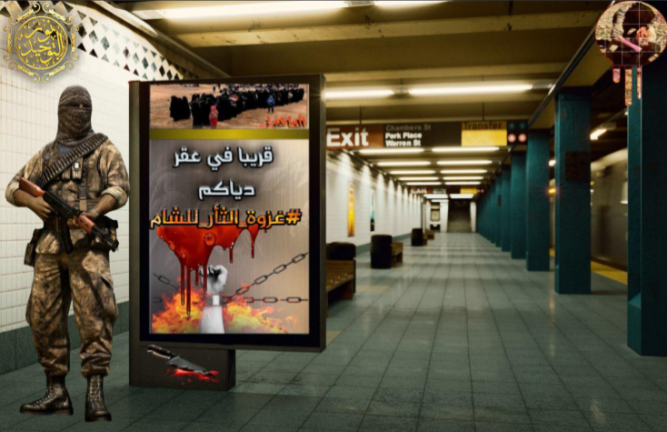 This week, ISIS published photos showing its operatives engaged in military activity around the city of Derna, probably in Al-Fataeh (Akhbar al-Muslimeen, December 6, 2015). An ISIS leader in Derna, Murad al-Hasi, known by his codename Murad al-Saba, was executed by operatives of the Shura Council of the Jihad Fighters in Derna, which is affiliatedwith Al-Qaeda. Al-Saba was arrested by operatives of the organization in October 2015 (Al-Wasat portal, December 3, 2015). This is another step in the consolidation of Al-Qaeda’s branch in Derna and the removal of the remains of ISIS’s control of the city. According to a senior officer in the Libyan Army that supports the Tobruk government, ISIS operatives in Sirte are undergoing flight training with flight simulators. The training is taking place in Sirte using an advanced flight simulator for civil aircraft, obtained by ISIS in October 2015 from outside Libya. According to him, retired officers from Libya and the neighboring countries are supervising the training. An additional simulator for fighter planes may also have reached Sirte. A senior security source from an institute which monitors ISIS’s activity in North Africa confirmed that it is known that ISIS operatives in Libya undergo training in flying civil aircraft. 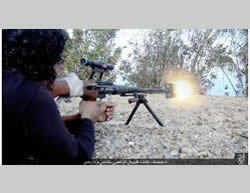 He added that last month, Libyan Air Force planes tried to destroy at least one training site, without success. According to him, due to the airstrikes, the training center was moved to a new site near Sirte airport (about 20 km south of the city). In the past, there were reportedly at least five aircraft at the airport, including two civil aircraft and three helicopters, which had been put out of commission in battles there in early 2015 (Al-Sharq Al-Awsat, December 1, 2015). In the meantime, ISIS continues to establish its control in Sirte, recruiting youths into its ranks (as is customary in Iraq and Libya). According to a report from late November, the graduation ceremony of the first Lion Cubs of the Caliphate course was held in Sirte. The participants were 85 boys aged 14-17. In the 45-day course, the boys underwent target practice with a variety of weapons and learned how to manufacture IEDs. The boys come from Sirte, Nofaliya, Ajdabiya, Bani Walid and Misrata(Bawabat Ifriqya al-Ikhbariya, November 30, 2015; Al-Wasat portal, December 4, 2015). On December 3, 2015, a lethal attack took place at a welfare center and rehab institute for the disabled in San Bernardino, California (east of Los Angeles).In total, 14 people were killed and 17 were injured. A man and a woman broke into a conference hall, opened fire indiscriminately at the crowd, and fled the scene. They left several pipe bombs in the building. Four hours later they were apprehended and shot during a gunfight with the police. A large quantity of weapons was found in their house. The man who committed the murder was Syed Rizwan Farook, 28, a native-born American of Pakistani origin. He served as an environment and food supervisor at the San Bernardino department of health. The father of the terrorist said that his son had supported the ideology of ISIS and was “obsessive” about his attitude to Israel (CNN, December 6, 2015). His wife, who participated in the attack, was Tashfeen Malik, 27, a Pakistani by birth who had moved to Saudi Arabia and came to the US after they married. The initial FBI investigation linked the two to radical Islam.Syed Farook was a devout Muslim who apparently underwent a process of radicalization and maintained contact with Islamists over the Internet. He visited Saudi Arabia, where he met his wife and returned with her to the United States. The day before the massacre, his wife posted a message on her Facebook page, pledging allegiance to the leader of ISIS. Both of them destroyed the hard drives in their home and their mobile phones before leaving to carry out the attack. According to a report from December 4, 2015, on the website of ISIS’s Aamaq media foundation, they were ISIS supporters(a3maqagency.wordpress.com, December 4, 2015). On December 5, 2015, ISIS’s Al-Bayan radio station aired an announcement about the attack “carried out by two supporters of the Islamic State a few days ago in California.” The announcement said: “The two, who attacked a center in the city of San Bernardino, California, USA, carried out a shooting that led to the deaths of fourteen people and the wounding of more than twenty others, Praise Allah” (arabic.cnn, December 5, 2015). However, ISIS did not issue an official statement claiming formal responsibility for the attack. On December 5, 2015, a passenger at the Leytonstone Underground station in east London was attacked by a young man.The attacker cut his throat with a knife while shouting “This is for Syria” and “Blood will be spilled here.” He threatened to attack other passengers. Police, who were on the platform, arrested the attacker. The passenger was taken to the hospital in serious condition. Another passenger suffered minor injuries. The stabber is Muhaydin Mire, a 29-year-old resident of east London. According to the investigators, his mobile phone contained photos related to ISIS and attacks that it has carried out (CNBC News; New York Daily News, December 7, 2015). Aden Governor Ja’far Muhammad Sa’ad and six of his escorts were killed on December 6, 2015, in an explosion carried out in the city. 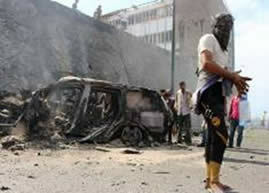 The explosion took place while he was driving to his office along with his bodyguards in a convoy of cars. According to one version, the explosion occurred in a parked car that exploded on the route of the governor’s convoy. According to a second version, the assassination was carried out by a suicide bomber who collided with the governor’s car. Aden Governor Ja’far Sa’ad was a general in the South Yemen Army and was appointed governor last October (alarabiya.net, December 7, 2015; The Guardian, December 6, 2015). The Aden-Abyan province of the Islamic State, which operates in Yemen, has claimed responsibility for killing the governor with a car bomb.On December 6, 2015, an ISIS-affiliated website posted photos from the Aden-Abyan province showing the ISIS car bomb explosion that killed the governor (dabiqnews.com, December 6, 2015). According to a document leaked by the Russian security services, 10 ISIS-affiliated Syrians went to Thailand in October 2015 with the aim of carrying out terrorist attacks there against Russian targets. The document calls on the Thai police and Special Forces arm to increase security around the areas where Russian institutions are located (The Guardian, December 4, 2015). On December 2, 2015, an ISIS-affiliated website posted an infographic claiming that in November 2015, ISIS had carried out 54 suicide bombing attacks, as follows: 28 attacks against the forces of the Iraqi regime, 13 against the forces of the Syrian regime, 11 against Kurdish People’s Defense Units (YPG), and three suicide bombing attacks against Kurdish Peshmerga (a total of 55 attacks, i.e., one was added by mistake).The distribution of suicide bombing attacks by province reveals that 16 attacks were carried out in the Al-Anbar province, 11 in Al-Hasakah, seven in Aleppo, six in Baghdad, five in the Salah al-Din province, four in Homs, three in Nineveh, one in Kirkuk and one in Deir al-Zor (a3maqagency.wordpress.com, December 2, 2015). These figures demonstrate the great weight of suicide bombing attacks in ISIS’s military-terrorist activity in Iraq and Syria. ISIS’s media foundation Aamaqhas inaugurated an app for Android devices enabling its supporters to follow the news published by ISIS. Among other things, the reports include news about developments in the battles in Syria and Iraq, videos, and graphs detailing ISIS’s activity. The app is easy to use and can be downloaded from the Internet. Many Twitter accounts post tweets with links for downloading the app. The new application might be a response to an announcement by the organization Anonymous on the closure of 11,000 ISIS Twitter accounts and Telegram’s announcement that it has closed 78 ISIS-affiliated accounts. On December 5, 2015, an ISIS-affiliated Twitter shared a link to a video from the Deir al-Zor province entitled “To the Jews,” which begins with a photo of Israeli Prime Minister Binyamin Netanyahu, against a background of the Israeli flag and photos of a soldier and a Palestinian boy. The ISIS operative threatens the Jews and other infidels and notes that the flag of Allah will be raised at the White House and in the heart of Tel Aviv. Next the video shows children executing captured members of the Syrian regime (Twitter; alaswar.ml, December 5, 2015). The information office in ISIS’s Al-Raqqah province released a video entitled “You Shall be Disappointed and Humiliated O Russians.” The video shows an ISIS operative beheading a “Russian spy” who describes the circumstances of his handling and capture. The video shows a Russian-speaking man dressed in orange prison garb introducing himself in Russian, with Arabic subtitles, as Magomed Khasiyev, a Russian from Chechnya. He says that he was sent to the Islamic Caliphate by the Russian intelligence agency. He “confesses” to having spied. When he finishes talking he is beheaded, and the Russian text “blood will be spilled like water” appears on the screen. The Russians did not provide evidence that the Turkish president’s family was involved in buying oil from ISIS.